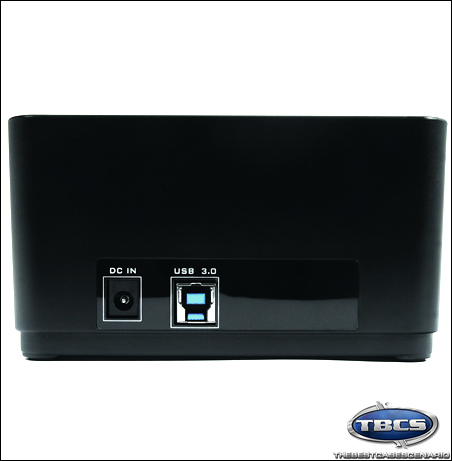 PC Hardware Review: Thermaltake Blac X 5G USB 3.0 HDD Docking Station. How many of you have a spare HDD laying around because all of the SATA ports on your motherboard are full? I am betting that the majority of you raised your hand. There are many solutions that would allow you to put that HDD to use, and today we are going to take a look at one solution that is blazingly fast...More after the jump. As I said in the intro, there are many options for putting that spare HDD to use when you have all of the SATA ports on your motherboard populated. You could buy an external enclosure, a USB – SATA adapter cable, or you could buy a desktop HDD docking station. The latter is what we will be taking a look at today. 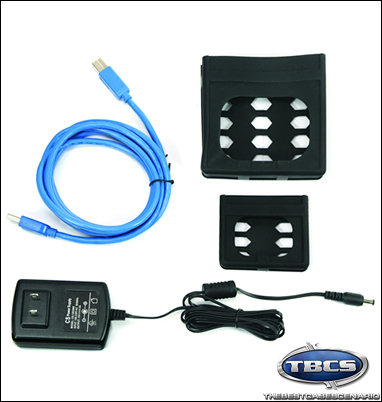 Thermaltake first released its Blac X line of HDD docks back in 2009 and TBCS was one of the first sites to bring you a full hands on review of both the Blac X single and Blac X Duet docking stations. 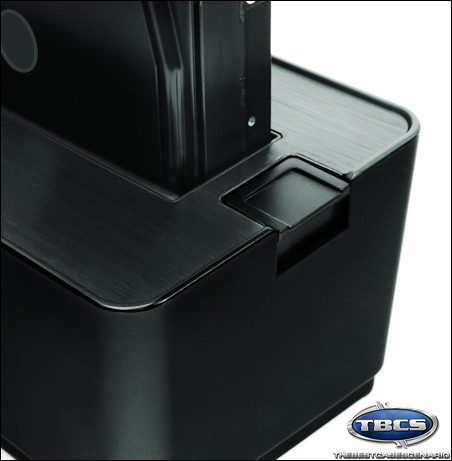 Today we bring you the Blac X 5G, a single slot, USB 3.0 hard drive docking station that is also SATA 3.0 compatible. Some of you will remember that I was quite impressed with the Blac X Duet I reviewed back in February of 2010, so when I had the opportunity to take a look at the new 5G version I was very excited. The Blac X 5G is very similar in appearance to its predecessors with a few small exceptions. The plastic top has been replaced with a brushed aluminum plate which has been anodized black, the power button has also been replaced with a round edge lit button and the eSATA port has been left off. Most notably though, is the USB 3.0 functionality. Thermaltake claims up to 5GB per second maximum transfer rate, and the ability to transfer a 25GB HD video file in just 1.25 minutes. I will test this claim later in the review. One unique feature I have not seen on other HDD docking stations are the silicone jackets Thermaktake includes with the Blac X 5G series. I assume these are to prevent the HDD from rocking back and forth in the cradle, which could cause damage to the SATA connector on both the dock and the HDD. 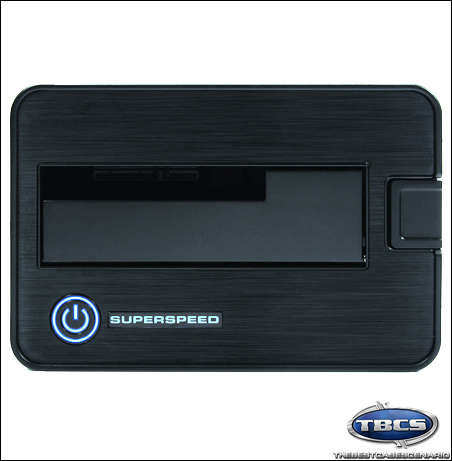 Supports USB 3.0 SuperSpeed – Maximum Transfer Rate up to 5.0 Gbps. Backward-Compatible with USB 2.0 (Max: 480 Mbps) & 1.1 (Max: 12 Mbps). Premium Shielded USB 3.0 Cable – Corrosion Resistant Plating & Heavy Gauge Wires for Years of Reliable Use. 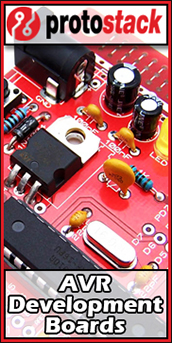 Plug & Play Installation – Ready to Work in seconds, No Software needed. Supports 2.5” & 3.5” SATA I/II/3.0 & SSD Hard Drives up to 2 TB. Hot-Swap Capability for Rapid Multi HDDs Access & Exchange. Trendy Docking Station Design maximizes Heat Dissipation & Exhaust. Windows & Mac OS Compatible, Windows 7 – 32 & 64-bit Ready ! Supports SATA III (6 Gb/s) Hard Drives with maximum speed up to 5.0 Gb/s (maximum theoretical speed offered by USB 3.0). I chose to use an OCZ Agility 2 SSD for benchmarking to hopefully achieve the fastest results possible. The Agility 2 SSD was formatted between each test to ensure a constant and accurate data set. I ran each benchmark first with the Blac X 5G connected to a USB 2.0 port. Then Formatted the SSD. The same benchmark was ran with the Blac X 5G connected to a USB 3.0 port. Results were recorded and published below. The first benchmark I ran was a simple 1GB file transfer in which I recorded the transfer speed shown in the windows file transfer window. As you can see the Blac X 5G was able to copy the file over in 49.1 seconds using USB 2.0 and 12.4 seconds using USB 3.0. That's an increase in speed of almost 400%. The next benchmark I ran was CrystalDiskMark set to test with a 1gb file. USB 2.0 Sequential Read and Write were both about the same at just over 32mb/s each. USB 3.0 Sequential Read and Write speeds were both much faster as expected. Sequential Read topped out at 131.2mb/s, another 400% increase in speed. Sequential Write came in at 64.3mb/s which is a respectable 200% faster than USB 2.0. When I reviewed the Thermaltake Blac X Duet over a year ago I was very impressed. I used the Duet daily to backup files, and migrate files from one pc to another. The one thing that always bugged me was the transfer times. Sure it had an eSATA port but eSATA cables are thick, fairly short and never wanted to bend the way I needed them to. Once I began using a USB 3.0 motherboard I became accustomed to the super fast transfer times. I actually began using the electronics from a USB 3.0 HDD enclosure to handle most of my bare HDD file transfers. I will admit that when Thermaltake announced the Blac X 5G USB 3.0 dock I knew I had to have it. While the unit I reviewed only has space for 1 HDD, it has made my life much simpler. It use to take me about 2 hours to migrate a 500gb backup, that time is now cut by 2/3rds. The Blac X 5G is a permanent fixture on my home desk and I will be purchasing one for my office desk. It is the perfect accessory for anyone who owns a PC. If you have a laptop that is broken, the Blac X 5G will quickly let you pull your important files from the HDD without having to open your desktop to install it. 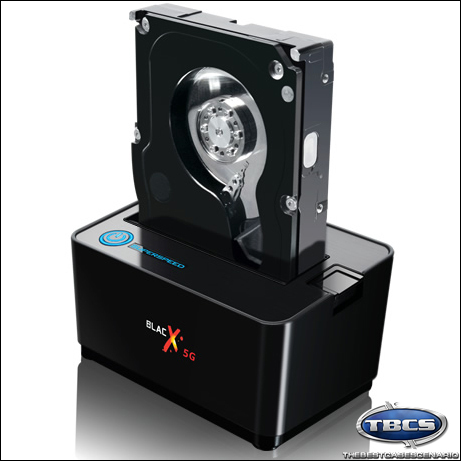 If you are like me and you have a few spare sata HDDs laying around collecting dust a the Blac X 5G is a must. Like I previously said, the Thermaltake Blac X 5G is virtually flawless and super fast. For those reasons I am awarding it our highest rating of 5 out of 5. This product was provided free of charge, by its manufacture for the purpose of review.